Putnam County Playhouse: BARN GETS A FACELIFT! 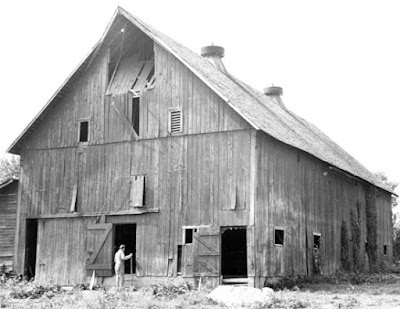 In 1981, Hazel Day Longden made a gift to Putnam County Playhouse of property on Round Barn Road that included two barns. For two seasons, shows were presented on an outdoor stage in front of the small barn. 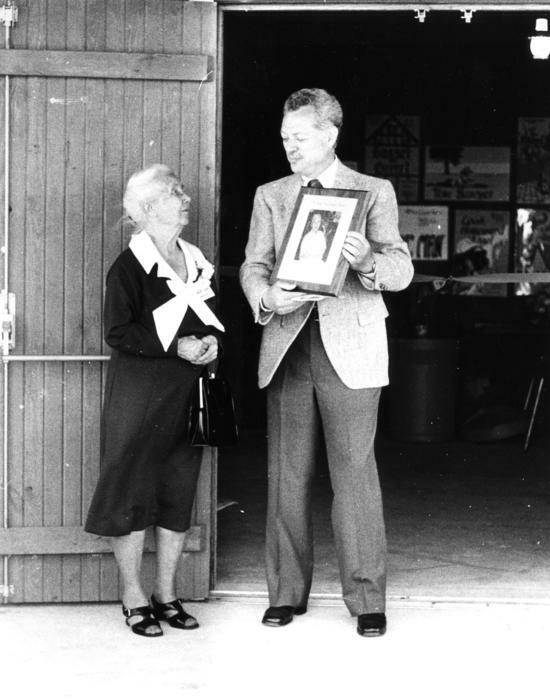 In 1983, renovations were completed on the big barn - and the Hazel Day Longden Theatre was dedicated. Hazel Day Longden and then PCPH President Jim Poor on June 4, 1983, dedication. Since then, the stage in the auditorium has held more than 800 performances of 128+ productions. This off-season, the stage was renovated so that the tradition can continue. After all of those performances plus countless rehearsals and meetings, the stage was rebuilt and strengthened. The proscenium was also enlarged so that set building could be facilitated. It was raised about two feet and squared off so that the opening would be more "plum" for building sets. The risers that hold the seats were also repainted for the first time since 1983! Since the building of the new Rehearsal Center in 2007, the small barn has been used for storage of flats, large properties, and set pieces. The past couple of seasons, there has been a problem with rain and other water coming into the building. A concrete wall and raising of the front entrance doors will solve this problem. As we get ready for our 2016 season, we are happy to keep improving our physical space and making it better for our participants and our patrons! Renovation photos by Linda Gjesvold. Played the lead in Mary Mary, on that stage in front of the old barn! Great memories. Loved swinging on stage in DePauw Little Theater for Little Mary Sunshine. Wonderful memories!